Every somewhat civilised visitor of Vienna will go to at least one of the many art museums that Austria's capital has to offer. The Kunsthistorisches Museum Wien clearly takes the lead - aligned with the Hermitage of St. Petersburg, the Uffizia in Florence, the Prado in Madrid, the Louvre in Paris and the Pinakothek in Munich, the "KHM" as it is known to the Viennese is among Europe's finest museums of fine arts. 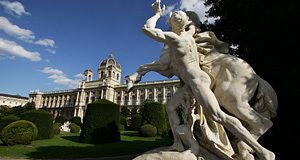 The KHM contains what used to be the result of many Habsburg generations' obsession with art. Like rarely any other dynasty of Europe, the Habsburgs collected artwork like crazy and spread this passion among the high-ranking nobility of their empire. Today, the KHM holds the fourth largest collection of paintings, the largest collection of Egyptian papyri, art objects from Greek, Roman, Etruscan and other early cultures as well as Renaissance collections, "devotionalia" (religious art) and the crown jewels of the Holy Roman Empire of German Nation, Austria, Hungary, Sicily and a whole bunch of other territories that were part of the Habsburg's portfolio of possessions. Fortunately, the wealth of the museum was split up into several divisions and so the structure of the exhibition doesn't overwhelm you completely. The way in which the collections are organised allow you to explore them in a surprisingly gratifying manner. There is a principal division into Oriental Art and sculpture on the ground floor; and paintings in the first floor. The Paintings are divided into "Germanic" (German, Austria, Dutch, Flemish) painters and Italians. The building in which the "Gemäldegalerie" is housed was designed on order of Emperor Franz Joseph I in the process of re-modelling the Ringstraße where the town walls of Vienna had been torn down. The design of the building is in Italian-like neo-Renaissance and mirrors the almost identical Naturhistorisches Museum (Museum of Natural History). This reflects the ambition behind the foundation of the museum: To document the state-of-the-art knowledge on art and sciences. The architects in charge were Gottfried Semper and Karl Freiherr of Hasenauer, who supervised the construction of the two twin-buildings between 1872 and 1891. The core of the exhibition is based on the collections of Archduke Ferndinand II of Tyrol (primarily armour and portraits), the grandson of the legendary Emperor Maximilian I. He was the father of Schloss Ambras Castle by Innsbruck, which is still managed by the KHM as sort of an Alpine outpost. Another key-part of the collection was contributed by the keen art collector Emperor Rudolf II and the paintings and portraits of Leopold Ludwig. Further generations of the Habsburg family steadily increased the number of paintings. The "speciality" of the KHM is the collection of 16th and 17th century paintings, including the World's largest collection of Bruegels, Venetian art by Tintoretto, Veronese and Titian and an extensive section on German and Flemish Renaissance and Baroque paintings by exquisite artists such as Rembrandt, Cranach, Dürer, van Dyck and Rubens. It definitely paid back for the Habsburgs (and Austria) to rule over the Netherlands and Northern Italy during Baroque days. Other masterpieces include the works of Cellini's salt cellar "Saliera", which became a national icon when it was stolen and re-appeared a few years ago.